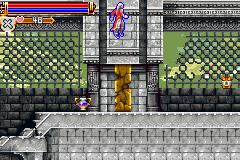 GBA Castlevania: Harmony of Dissonance (USA) in 07:50.1 by gstick. The main quest completion time has been shortened to nearly one fourth of what it initially was, thanks to the discovery of a glitch that allows Juste to sink into walls. This is a 3:25.15 minute improvement over klmz's movie. Like in the previous movies, the author picked up an item to display those cool CRITICAL's for entertainment, at the cost of some time. However, if you still think there is not enough zipping through walls, be sure to watch the second quest completed in less than half a minute!